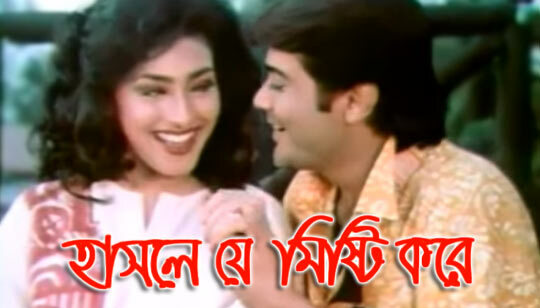 Hasle Je Misti Kore Lyrics from Moner Manush Bengali Movie: Presenting ' Hasle Je Misti Kore Prem Jhore Du Chokh Bhore ' Bangla Romantic Song Lyrics. featuring: Prosenjit Chatterjee And Rituparna Sengupta. The song is sung by Kumar Sanu And Sadhana Sargam And Music composed by Dilip Sen-Sameer Sen. This Bengali Movie Directed by Sujit Guha.